From its start at the Essex County Environmental Center, the main trunk trail of Patriots' Path can be hiked all of the way to its terminus in Stephens State Park on Waterloo Valley Road. There are some unblazed and proposed sections along the way. Starting at the Essex Environment Center, where there is parking, the trail follows the Passaic River down an increasingly narrow trail to Eagle Rock Avenue. The trail follows this road to cross a bridge. The trail reaches the intersection of Eagle Rock Avenue and River Road and turns left onto River Road. The trail crosses River Road and goes through the woods behind East Hanover's Lurker Park. This section is poorly maintained. There is a split in the trail somewhere in the woods; a blue spur veers off to the left. This spur then rejoins the main trail closer to Lurker Park. Once reaching Lurker Park, the trail follows along the tree line and then joins one of the paved paths through the park. Patriots' Path follows this path to a small gravel parking lot on Ridgedale Avenue. Here the trail turns left, following Ridgedale Avenue for a while. The trail turns right onto Barnida Drive at a traffic light. Patriots' Path then turns left onto Petry Drive, follows this road to its end and then turns left again onto Gail Drive. Gail Drive ends, but the trail continues straight onto a grass easement. There are little to no trail markers here. The trail reaches the terminus of Valley Road and continues following this road. Valley Road ends at Troy Road and the trail turns right, following Troy Road. Shortly after crossing a bridge, the trail turns left, crossing Troy Road and proceeds into a wooded area called Hanover Farms. There is a small parking area on the right side of Troy Road across from the trailhead. 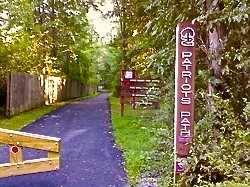 Patriots' Path follows along the Whippany River on a narrow trail that is usually heavily overgrown in the warmer seasons. There are a few bridges along this section to help cross the more swampy areas. The trail gradually turns to the right as it follows the river. It skirts behind a neighborhood, paralleling Troy Road. Eventually it turns to the right again and meets Troy Road again. Patriots' Path turns left, following the road briefly, crossing a bridge. After the bridge, the trail turns right to cross Troy Road and proceeds into the woods. Here, the trail parallels Troy Road through these woods. The trail meets Troy Road again and immediately turns right, back into the woods. The trail splits in the woods and white trail turns left back toward Troy Road. At the split, a blue spur goes right and proceeds through the meadows to South Beverwyck Road where it ends for now. Turning left, the white-blazed trail meets Troy Road and follows along the road briefly before turning left onto Griffith Place. The trail follows this street and then turns right onto South Beaumont Place. Patriots' Path follows this street to Troy Hills Road, turns right again and follows Troy Hill Road to the traffic light. At the traffic light, the trail turns left onto Bee Meadow Parkway and follows this road for a while before turning left onto Hillary Court. 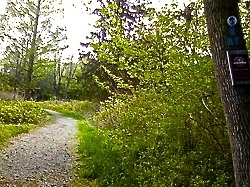 At the cul-de-sac, the trail continues into the woods to the right of a paved path. The rocky trail reaches Reynolds Avenue near Bee Meadow Park and turns left. Patriots' Path follows Reynolds Avenue to a traffic light and then crosses Reynolds Avenue at the crosswalk. It then turns right, following Reynolds Avenue on the opposite side of the street back toward Bee Meadow Park. The trail turns left down Pond Drive and terminates at the parking lot for now. Although the trail ends here, the proposed trail is mapped out and can be followed to reach the next trailhead at Woodland Road. Turing left, the proposed section follows an existing trail along the edge of a soccer field. The trail then turns slightly right and continues along the side of the pond. After crossing under power lines, the trail turns right and follows the power lines toward Parsippany Road. About an eighth of a mile down this trail, a narrow trail veers off to the left into a wooded area. Following this trail to a clearing, the proposed path proceeds through a grassy area between two houses and reaches Parsippany Road. The trail turns right and follows Parsippany Road to the existing trailhead at Woodland Road. At Woodland Road, there is a small parking area to the right. Patriots' Path follows along Woodland Road and then turns left onto a service road toward a small substation. Patriots' Path then turns right, following the power lines to North Jefferson Road. The trail then turns left along this road on a side walk and then turns left again after crossing a bridge. There is a Patriots' Path post here, and the trail goes through the woods and then continues through a grassy area, gradually turning to the right along a tree line. Patriots' Path then reaches a small community off of Route 10 and follows along the edge of a parking lot until it reaches a road. It follows along this road until it turns left along another parking lot and then into a small wooded area. The trail then reaches a jug-handle for the Pine Plaza at Route 10. Patriots' Path crosses Route 10 at the light here and then follows the mall driveway briefly. It turns left, crosses a small brook and reaches the Old Mount Pleasant Avenue. The trail follows this road to Parsippany Road where it turns right. Patriots' Path then follows Parsippany Road and then turns right onto Whippany Road at the light. The trail follows Whippany Road until turning right again onto Eden Lane at another traffic light. The trail follows Eden Lane for a while and then goes off to the left into Central Park on a paved trail going along the Whippany River. From here the trail is part of a trail system of Hanover Township called Connect Hanover. 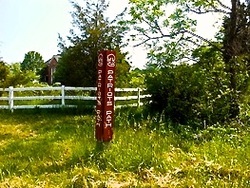 The trail is marked with mile markers and it very well maintained until it reaches the border of Morris Township. The trail through Central Park terminates at South Jefferson Road and Patriots' Path turns left, following South Jefferson Road along shared-use path. It follows this pedestrian/bike path to Cedar Knolls Road. At the light, the trail crosses Cedar Knolls Road and turns right, continuing to follow the shared-use path across the I-287 bridge. After crossing the bridge, Patriots' Path turns left onto a paved trail following along I-287 and the Whippany River. Then the trail skirts along the perimeter of the Woodmont Knolls and continues into woods. The trail reaches an abandoned train yard and turns right down a driveway. Patriots' Path reaches the cul-de-sac of East Fredrick Place and turns left at the Patriots' Path post. The trail proceeds along the side of the abandoned train yard and crosses the Whippany River on a beautiful bridge. The bridge brings the trail into the Frelinghuysen Arboretum North Tract. It follows along the Whippany River and then arrives at the Morristown Community Gardens. The trail follows the driveway back to Hanover Avenue where it makes a left, following the road to the Morris County Library where it crosses the street at a traffic light. Here, the trail crosses into Morris Township and is no longer part of the Connect Hanover trail system. Note: The section between Pocahontas Lake and Cory Road is closed. Please use the provided detour. There is parking at the Arboretum and the Community Gardens to access this section of the trail. Patriots' Path splits here: the blue spur goes to the left through Frelinghuysen Arboretum to Acorn Hall (see below), while the white trail continues to the right along the opposite side of Hanover Avenue, back towards the sewage treatment plant. The trail turns left, following the county jail service road. Patriots' Path follows this service road along the river and then turns right up a hill to the Morristown-Erie Railroad. It reaches the railroad and turns left to follow it. This trail is completely overgrown and is nearly inaccessible. The best way around is to follow the railroad tracks to John Street. These tracks are out of commission, but are very rarely used. Please exercise caution following the railway. Patriots' Path then follows along a parking lot off of John Street and then turns right onto John Street, following it to Ridgedale Avenue. At the light, the trail crosses Ridgedale Avenue and turns right briefly following the road. It crosses the railroad and then turns left along a fence. Patriots' Path follows the railroad along this fence to the end of Garden Street. The trail then follows Garden Street and then turns left onto New Street. The trail reaches the end of New Street and crosses Abbett Avenue into Abbett Avenue Park. Patriots' Path continues along the edge of the park and reaches the parking lot on George Street. The trail follows George Street to Martin Luther King Avenue and turns left. It follows this road under the train tracks and turns right. There are signs here saying that the trail ends, but you can follow the trail along the tracks, past Pocahontas Lake, to the edge of a train yard where it temporarily ends. ​The trail will soon go around this train yard, but for now, it ends here. To detour this closure, go back to Martin Luther King Avenue and turn left, following this road up the hill. Reach Hillary Road and turn left. Follow this to Cory Road. Turn left onto Cory Road and proceed carefully under the train tracks. On the other side of the bridge, the trail can be picked up on the left. 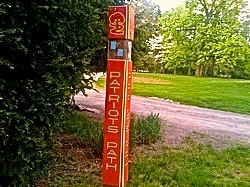 Patriots' Path follows along the left side of Cory Road on a narrow gravel path. When the path ends, carefully cross Cory Road and proceed to the intersection with Speedwell Avenue. The trail crosses Speedwell Avenue at the light, turns left onto the sidewalk, and then turns right down a hill into Speedwell Park. There is parking here at Speedwell Park. Patriots' Path continues through the parking lot to a paved trail going along the Whippany River again toward Lake Road. Along the way there is an access trail on the left that leads to Elliot Street Park. At Lake Road, the trail goes right and across the bridge continuing on the right sidewalk on Lake Road. Then the trail turns left and crosses Lake Road, following closely on a dirt and gravel path. The trail meets Lake Road again and it crosses yet another bridge, and then goes to the left into the woods following the North Branch of the Whippany River. The trail is paved going through these woods and crosses an old railroad bed for the Rockaway Valley Railroad. It then turns right along the Whippany River again and passes a sewage plant again before it comes out on Lake Valley Road where there is parking. The trail crosses Lake Valley Road and goes through the woods and comes out on Inamere Road. There is another parking area. The trail crosses Inamere turns to the left and heads to Sussex Avenue where there is limited parking, still on pavement. It then splits at Sussex Avenue; to the left is a paved blue blaze trail that goes through Washington Valley Park (see below) and loops back to the white trail, but going straight, the trail is gravel and intersects Washington Valley Road where there is parking. Crossing Washington Valley Road, the trail continues on the Rockaway Valley Rail bed to Whitehead Road. There is parking here too, and the trail continues into the woods of Lewis Morris Park. After climbing up the long and steep hill, the trail turns left and heads along the top of the hill. Towards the bottom, it makes another left turn and heads back towards the Whippany River. It follows the river down to Sunrise Lake. There is a parking area here, across from Sunrise Lake. The white trail turns right here, but the blue trail heads straight to Sunrise Lake and Lewis Morris Park. Heading right after crossing the bridge, the trail remains white blazed and on the rail bed and parallels Mendham Road. The trail crosses Tingley Road at a crosswalk. There is a neighborhood access point for Glen-Gary Road on the left somewhere down the trail shortly after crossing Tingley Road. The trail splits up ahead; a blue trail heading south to Ralston (see below), and the white trail continues to the right toward Dismal Harmony Natural Area. Taking the white trail, the trail hits E. Main Street and turns right following the road until it crosses the street and heads into Dismal Harmony Natural Area where bikes are prohibited. There is parking here off of East Main Street for the park. The trail enters the reservation here and closely follows the Dismal Brook. The trail crosses this brook on a bridge and then turns left up a hill. There is a yellow loop off of this trail that heads up to Legend Rock. The trail comes out at Woodlawn Terrace where there is more parking for Dismal Harmony Natural Area. The trail heads down the road and it turns right onto Woodland Road following the Harmony Brook now. It then turns right again, continuing on Woodland Road. After you pass Clyde Potts Resevoir, the trail is narrow and extremely overgrown. It leaves Woodland Road, which heads to the left, and follows along the power-lines crossing a few brooks. At the top of the hill the trail splits, one heads right to a parking lot on Old Brookside Road and is blue blazed. The white blazed Patriots' Path continues left into the woods following Randolph trails. After climbing over hills, the trail intersect the abandoned section of Dolly bridge Road where it turns right. At the top of the hill there is a four way split in the woods. Continuing straight, the white trail intersects Combs Hollow Road at a parking lot, to the left is a non-blazed trail to Calais Road, and to the right is a short trail leading to Dolly Bridge Road. Following the white trail straight, it follows the abandoned Doby Road to Combs Hollow Road where there is parking. The trail crosses the street and follows along Doby Road on a sidewalk to Heisteins Park. At the pond, it turns left onto a paved path and then makes another left around the lake. It continues around the lake to a dirt parking lot, and then continues on the paved path along baseball and soccer fields to Dawson Road. Patriots' Path then continues onto Dawson Road and heads to South Road. It crosses South Road and continues into the woods behind the cemetery. There is parking in Heisteins Park for this trailhead. The trail goes through open space behind the cemetary and intersects Ironia Road. The white trail turns right and follows this to North Road where it then crosses onto Hugg Road and turns left into Black River Wildlife Management Area. It winds through Black River WMA until it comes to the West Morris Greenway. Here, a blue trail goes to the right to Pleasant Hill Road along the West Morris Greenway. 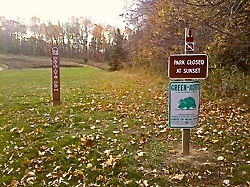 This Greenway reaches all of the way to Horseshoe Lake in Succasunna. Turning left on the white trail along the Greenway, it rides along the Old Central Railroad. The white trail then turns left off the main trail after about a mile and goes up a steep hill following an underground phone cable. Where the white trail turns left, the Greenway continues back to Pleasant Hill Road again and is blue blazed. The white trail, after climbing the hill, takes a left turn off of the phone cable right of way and onto a rail bed, then makes another slight left and continues. The white trail then makes a hard right, crossing the rail bed, and continues through the swamp of Black River WMA. The trail crosses a bridge and winds through the woods to Black River fields where there is parking. Follow the driveway down to North Road. Carefully cross North Road at the crosswalk and follow the trail through Highland Ridge Park (there are currently no blazes). It heads towards the back of the field off of North Road to a trail. It follows this trail which turns to the right. It then makes a hard left at an intersection and continues. The trail then turns to the right and then heads straight until the trail approaches an open field with a large hill. It makes a slight right and heads slightly uphill then makes a hard left at the paved road and heads up to the top of a hill. Here, there is a 360 degree view of Morris County. Head down the hill to County Highway 510. Turn right and follow 510 back to North Road (County Route 513). Follow the red brick walkway by crossing at the light. There are still no blazes, but the walkway connects to the next trail head. The white trail goes through the center of Chester and then across Route 206. Then it follows the red brick walkway to the trail head off of E. Main Street where Parking is available. The trail heads into the woods following the Central Railroad bed. Follow the rail bed across power lines and back into the woods. Here, a blue spur heads straight and goes through Black River County Park and all of the way to Daly Road (see below). The white trail turns right and leaves the Central Railroad bed and heads to Furnace Road, crossing two brooks on bridges. At Furnace Road, the trail continues across the street, slightly to the left. Here the trail is back in the Black River WMA. After winding through the woods, the trail turns right and joins the Central Railroad again briefly to cross the Black River. It then turns right and heads to Tanner's Brook Road. It goes across a field, then turns left and follows rows of Conifer Trees to Tanner's Brook Road. It turns right and follows Tanner's Brook Road to the next trailhead. It turns left and goes into a wooded area owned by the Township of Chester. The trail parallels the road a while, but then turns up the hill meeting a hunting trail. The hunting trail splits many times in the woods, so follow the Patriots' Path medallions and not the cut-out white blazes. After winding up a hill and crossing power lines, the trail descends toward the Black Oak Golf Course. The deer hunting trail ends at a grass trail, but Patriots' Path turns left and heads to a gravel road. Cross the gravel road and head straight through the woods. The trail then turns right and comes to another golf-course road. Head to the left and make a quick right following the Patriots' Path blazes into Palmer Park. Follow the blazes along the fields and the driveway to Bartley Road. There is parking in Palmer Park. The trail turns left here and follows along Bartley Road and then turns right, crosses Bartely Road, and heads into the woods. It goes through the woods shortly and meets the Columbia Trail. It turns left and follows the Columbia Trail until the intersection with the Gillette Trail where it turns right, following the Highlands Trail into the Palmer Fishing Access area off of Fairview Avenue. Note: The section between Reservoir Road and Candour Court is proposed and may lie partially on private land. Use at your own risk. 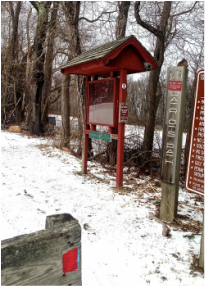 There is parking here at the Palmer Fishing Access Area off of Fairview Avenue for Schooley's Mountain Park and the Columbia Trail. The trail goes through the parking lot and crosses Fairview Avenue. From here it winds through Schooley's Mountain Park along the well marked and maintained trails. After traveling through the park, it meets another parking lot for the park off of East Springtown Road. Follow the blazes through a field to East Springtown Road. Cross East Springtown Road to another parking area and turn right into the woods. Here, the Highlands Trail and Patriots' Path follow the Electric Brook to Rock Road. To the right is an unmarked trail leading to Dogwood Drive along an old sewer line and is a proposed blue spur of Patriots' Path. The spur was supposed to follow Dogwood Drive, turn left on Spruce Lane, and right on Hemlock Drive out to Naughright Road. Across Naughright, a section of Patriots' Path was blazed through the land between Wellington Drive and Windswept Way, but was never fully completed. The trail then travels to Rock Road following the Electric Brook. The trail is very Rocky through Schooley's Mountain County Park has a lot of bridges and wooden platforms crossing over swampy areas. Across Rock Road, the trail follows the driveway to Falcon Fields. There is more parking available at the fields. The trail then follows a paved path through the park and then turns off to the right behind the backyards of Partridge Lane. It then crosses Flocktown Road and goes along the school grounds and into the woods intersecting power lines. Then the white trail turns left and follows the power lines across Hunter Drive and then to Quail Run. The trail then follows the roads: turning right onto Quail Run, then making a left onto Winay Terrace, then another right onto Sparrow Lane where, at the cul-de-sac, the trail goes into the woods. The white trail goes down a hill along many switchbacks, and intersects the abandoned Mission Road. The trail then turns right follows this abandoned road to Reservoir Road. Here, Patriots' Path turns left and leaves the Highlands Trail to follow Reservoir Road on sidewalks. Then it turns left into the woods, crosses a brook, and ends at a paved road off of Candour Court. The trail is then unblazed as it follows Candor Court to Heron Drive. It turns left and follows Heron Drive to Heartstone Road where it turns right. Then Patriots' Path turns left onto Peach Tree Lane and then right again through the blockbuster parking lot to Route 46 and turns left. Follow Route 46 West to East Avenue and turn right. Then follow this street until the blazes reappear on Mine Hill Road. Follow the abandoned road and then the trail turns left up a steep hill through Stephens State Park where it realigns with the Highlands Trail. Follow Patriots' Path and the Highlands Trail through Stephens State Park up to the main parking lot for Stephens. The trail then continues straight through the park and ends at Waterloo Valley Road. There is parking here. Parking is off of South Beverwyck Road north of its intersection with Bee Meadow Parkway. The trail temporarily ends here. The trail goes east then turns south and follows power lines. It then turns into the woods and meets the white trail. This spur can be overgrown at times, but is a nice hike through the meadows. Off of East Hanover Avenue, across from the Morris County Library is the Frelinghuysen Arboretum. There is parking at the Arboretum. From Hanover Avenue the blue trail goes up the driveway to the Arboretum. The trail follows a gravel sidewalk and goes past a black gate and turns right down a grass path and up a big hill. The trail continues changing from gravel to grass a lot. It winds through the beautiful arboretum grounds. The trail then goes through a deer fence and turns left, following the Whippany River. It then crosses a parking lot and goes up a hill to Acorn Hall. Then the trail intersects the Acorn Hall driveway and Lafayette Avenue. The trail crosses Lafayette and continues down Morris Avenue to Ford Mansion where it ends. Across from its terminus is the popular biking trail, the Traction Line. Off of Sussex Avenue there is a trailhead for a paved alternate bike route. The paved bike trail goes through Washington Valley and is blue blazed. Then the trail turns right at Washington Valley Road at a parking lot and is no longer paved. The trail then winds through the woods before intersecting Washington Valley Road again. It turns right and follows the road briefly before ending at the white trail parking lot. From here it goes left (from Sussex its a right) and it brings you back to Washington Valley Road. There is parking at Sussex, and both Washington Valley intersections. There is parking across from Sunrise Lake and in Lewis Morris Park. The trail crosses Mendham Road following the Yellow and goes around the lake. 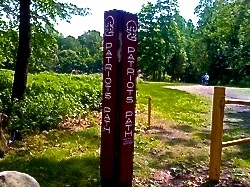 Patriots' Path turns right at the rain shelter and goes through Lewis Morris Park on well marked trails. The Blue and Yellow then meets the Green Trail and Patriots' Path and the Yellow Trail continue straight. They intersect the Green Trail again, and the Yellow Trail heads straight, following the Green Trail, while Patriots' Path then turns slightly left and enters Jockey Hollow Park. 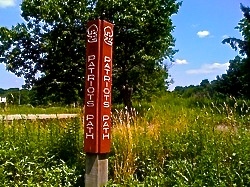 It intersects the Grand Loop Trail where blue blazes end, but Patriots' Path is marked with medallions. It turns to the right and follows the Grand Loop Trail, then turns left down a hill into the parking lot in front of the Soldier Huts. Then it crosses Sugar Loaf Road and continues back into the woods. Follow the medallions through the woods until the trail merges with the Aqueduct Trail. Patriots' Path turns slightly left to merge with the Aqueduct Trail for about a quarter mile, then turns left again, leaving the Aqueduct trail and comes out at the Trail Center parking lot. It skirts the edge of the lot and then heads into the woods, intersecting the New York Brigade Trail. It turns right, crosses the tour road, and follows the Old Camp Road Trail where blue blazes resume. These blazes, however, are not Patriots' Path blue blazes; the New York Brigade Trail is marked blue all through Jockey Hollow, so follow the Patriots' Path medallions. The Old Camp Road Trail then intersect the Grand Loop Trail. The Grand Loop Trail and the Old Camp Road Trail align for a brief period, then Patriots' Path turns right where the trails separate, following the Grand Loop Trail again. It follows this trail to Tempe Wick Road. The trail crosses Tempe Wick Road and turns right. Then Patriots' Path turns left, separating from the Grand Loop Trail onto the New Jersey Brigade Trail. The trail winds through Jockey Hollow Park south of Tempe Wick Road and then splits. The trail to the right continues to a parking lot and is blazed red to the parking lot for the Cross Estate Gardens. Going left it continues to another fork in the trail about three-quarters of a mile down. To the right, Patriots' Path goes to Hardscrabble Road, turning left Patriots' Path comes to another fork. Turning right will take you in a loop back to the trail that leads to Hardscrabble Road. Turning left here will take you to a red trail (not sure if red PP or blue PP) through Scherman-Hoffman Sanctuaries and ends at a parking area off of Hardscrabble Road. There is parking here across from Sunrise lake and in Lewis Morris Park. Turn left onto the white trail and follow it along the river until the trail splits. Heading left onto the blue spur, the trail winds through the woods, crosses a narrow stream and turns right along a white fence. The trail follows the fence to Cherry Lane. Crossing Cherry Lane, the trail goes behind the Mendham Township Police Department and goes back into the woods. The trail then crosses the driveway to an elementary school and heads along a railway bed to Cold Hill Road. After crossing Cold Hill Road, the trail goes along the Mendham Commons. Through these woods the trail turns and twists and it ends up at Mountain Avenue Park where there is a parking lot. Continuing across Mountain Avenue, the trail continues along the railway bed to Ironia Road. There are many places along the way where there should be bridges, but instead there are cement stumps that can be stepped across, while bikes can be walked through the shallow streams. After crossing Ironia Road, the trail follows a private driveway. There is no biking allowed on the private road. At the end of this driveway, a narrow trail continues heading through the woods. The trail then ends up across from the Ralston Fire House on County Route 510. There is a recreation center across the street and the trail continues. The blazes disappear towards the end of the trail. Continuing past the last blaze there is a river crossing with no bridge. The trail then turns right somewhere along this trail, however there are no blazes to indicate this. The trail continues through these woods toward Mount Paul Memorial Park. There is a river crossing along the trail that is difficult to pass. Closer to Mount Paul Place the blazes start to reappear. The trail continues through the Burnett Brook Reserve and temporarily ends at Mount Paul Place. There is parking off of Old Brookside Road and the trail is blue heading down Randolph Trails. It connects to the white trail coming from Clyde Potts. This continues to Heisteins Park as the white trail. The blue trail is very short and it is very well maintained. This trail connects with Randolph Trails. There is a parking lot off of the Old Route 24 near The Lamplighter Restaurant. Follow the white trail along the gravel railway bed until you reach the blue spur. The white trail bears right, while the blue trail heads straight. Follow this trail through the woods following the Black River. The trail is narrow and rocky, but very nice for hiking. The trail goes next to a dam and then goes through an underpass under County Route 513 to the Cooper Mill in Black River County Park. The trail is well marked and maintained through Black River County Park. Follow this blue blazed spur, called the Black River Trail, through the park. The trail parallels the Black River to an abandoned bridge where it turns left and continues to follow the Black/Lamington River. The trail then turns left and up a hill until reaching a split; the Conifer Pass Trail heads straight and the Black River Trail turns left. Continuing to the left on the Black River Trail (blue PP), the trail will come to Kay Environmental Center. Across the parking lot, the blue spur continues onto the Bamboo Brook trail. Follow this trail to Pottersville Road. Turn right and follow Pottersville Road for about an eighth of a mile and then turn left back into the woods following the blue blazes. The trail winds through these woods and intersects the Conifer Pass Trail (red PP) again. The trail then turns left and continues through the woods and down a large hill. It heads towards a small brook, called the Herzog Brook, which it then follows to Lamerson Road. Cross Lamerson Road and head through the woods to Longview Road. Crossing here will take you through more woods and then along a cornfield. Along the field there are not many blazed. After leaving the woods, turn right along the cornfield and follow it to the left until blazes reappear. After hiking around the field it turns right, and then left along a pumpkin patch. It turns right again to continue following the pumpkin patch and then turns left into the woods. Here, the trail is blocked by trees. An easy reroute is to turn left and follow the unmarked trail straight until it intersects the Bamboo Brook Trail (blue PP) again. Continuing onto Patriots' Path again, the trail winds through fields and woods to the entrance to Bamboo Brook Outdoor Education Center. Here, the Bamboo Brook Trail continues straight onto a red Patriots' Path spur, but the blue spur makes a sharp right, now following the Willowwood Trail. The trail then passes through Willowwood Arboretum where another red spur splits off to a nearby parking lot. The blue trail then continues along the Rockaway Valley rail bed back across Longview Road and all of the way to Daly Road. Follow Daly Road to the left up to Route 206 where there is another Patriots' Path post. Blazes disappear here and it is no longer clear if the trail ends. Supposedly they continue to follow a power line just across Route 206, but the next place I found them were on an access road just off of Rogers Road. They start in the woods just off the access road, cross it, and then disappear again. A trail is supposedly flagged out all of the way to Old Chester Road, but I had no luck finding the trail. Not much parking available here. The trail is usually overgrown in the summer and is not well marked. The path starts at the corner of Old Chester Road and Gill St. Bernards Road. The path follows Gill St. Bernards Road closely behind hedges with private properties to the left. The trail then enters a wooded area still paralleling the road. On the left there is a large quarry of some sort. The trail then comes to the Peapack Brook and turns left. The trail is very poorly marked from here on out. The trail follows the brook closely, winding through the woods. The trail is easy to spot, but watch out for blazes when the trail is less obvious. After following the brook for a quarter mile, the trail comes to a telephone pole right of way and turns right, crossing the Peapack Brook. As of now, there is no bridge here and the brook is quite wide. There are some fallen trees that can allow crossing. Turning around, and heading back down the trail a few steps, there is a narrower portion of the brook with a large, rocky shore. Here, there is a fallen tree that can be used as a makeshift bridge to cross. After crossing, the trail follows the underground telephone pole right of way. The trail turns to the left, shortly after crossing the brook and continues to follow the brook, but at a further distance than before. Follow the telephone pole right of way until the trail turns to the left again. Here, the trail goes across a small bridge and up a hill to an open field. The trail is very sparsely blazed here, but the trail turns to the left and skirts the fields. The occasional blaze can be seen on the telephone poles as it skirts the fields, paralleling Old Chester and Roxiticus Road. After following the edge of these fields, the trail ends at a fence. To the left, the right of way seems to continue and it is not clear if it is private property or not. The right of way continues between fences, but I did not follow this trail. Instead, I followed the blazes to the right. Turning right, the trail is still marked blue, but it is in fact a red spur. The trail was originally the blue spur and was supposed to connect to the Schiff Nature Preserve before reaching the blue spur behind the Ralston Fire House. It has not fully been re-blazed into a red spur and many red and blue markers can be found along the trail. After skirting the field, the trail enters the woods, following the property line of a nice farm located on Roxiticus Road. Continuing through the woods and down a hill, the trail closely follows the farm, crosses the Gladstone Brook before finally terminating at Roxiticus Road. There is not much available parking at this trailhead, aside from a narrow, soft shoulder. This trail begins here and goes through the woods and ends up on Bartley Road near Ort Farms. There is parking here. The trail continues left down Bartley Road, follows it to Old Route 24 (CR 513), and turns right along the highway. It follows County Route 513 to a parking area for the Gillette Trail. 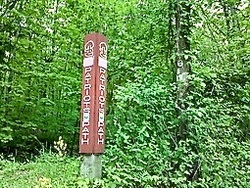 Patriots' Path follows the Gillette Trail to the Columbia Trail, and turns right following the Columbia Trail to Schooley's Mountain Park. The blue spur ends at the Palmer Fishing Area at the white trail. Off of Kahdena Road there is a parking area for Fosterfields where there is a trailhead. The trail winds through Fosterfields and connects to the bike trail off of Sussex Avenue. Although no bikes are allowed on the red trail, it is very nice for hiking. It is a good half a mile hike, very enjoyable. There is plenty of parking available at Chubb Park in Chester Township. The trail heads from East Mill Road and goes along the Chubb Park driveway. The trail follows the edge of the soccer fields and heads into the woods. The red spur then meets the Black River blue spur after crossing power-lines. There is parking here for the Bamboo Brook Outdoor Educational Center. Follow the blazes just left of the parking lot down to a driveway. The trail follows this driveway past a shed and finally to a deer exclusion fence where it terminates at the blue Bamboo Brook Trail.